AN EXAMPLE of how “family farm, ” a phrase that used to conjure up the modest and homely, has been re-defined within a generation was given by William Grimsdale this week. In the past 30 years, even the family farm has seen livestock numbers increase dramatically, machinery sizes treble and quadruple as the labour force declines, family members find outside jobs, and technology and cost-cutting become paramount. “We read about the recent World Record in the press and we were confident we could do better. Our experience in using two New Holland CR980 combines and our high efficiency approach to cereal production means we are very well placed to take on a challenge like this, and we’re delighted to have been so successful by operating the latest 591hp CR9090,” said Mr Grimsdale, managing director of Mountfair Farming Ltd based in Swinton in Berwickshire, UK, who organised the attempt on the Guinness World Record. Last year was certainly a bumper one for combining records. 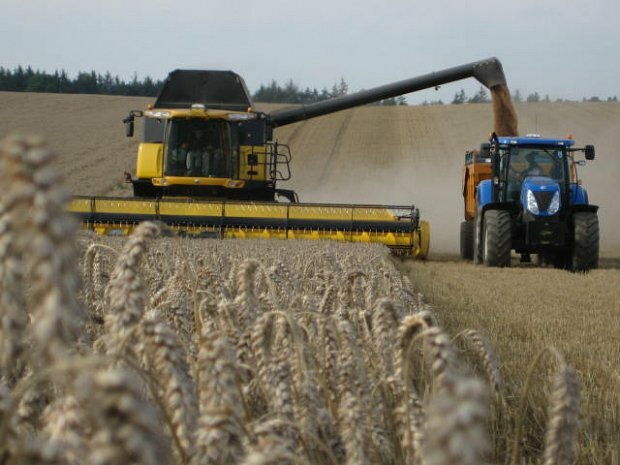 First came New Holland who took the Guinness World Record for the highest tonnage of wheat (451.2t) harvested in an eight-hour period in Germany in July. Then, in September, Claas set a new record of 532.1t in Lincolnshire with a Lexion 580. And just when we all thought that was it for 2008, New Holland announced it had retaken the top spot by combining 551.6t in commercial conditions on 26 September in Northumberland. This most recent record attempt took place on the farm of William Grimsdale of Mountfair Farming at Castle Heaton Estates. He and his son Jorin (who drove the combine) used a standard 2008 demonstration CR9090 with a new 10.7m header.